Want the best looking garden in the street? Your local Jim’s Gardening team can help, often with a same day service if our schedule permits. Whether its regular garden care and maintenance, or a one-off garden tidy up, the team at Jim’s Mowing & Gardening can help. Just call 131 546 [8am-8pm: 7 days] or Book Online. 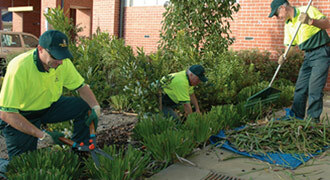 Get your weekends back, and let the Jim’s Gardening team take care of the gardening, weeding, pruning, mulching & more. Let our fully trained team get your gardening done professionally, with the right equipment & fast. Give yourself more time to actually relax and enjoy your garden again, rather than working in it. So whether a property is in between tenants or about to be put on the market – a well maintained garden will always add value to a property. Call Jim’s Gardening on 131 546 or Book Online for a free, no obligation quote. All of our team are professionally trained, insured and police checked. And our work is backed by the famous Jim’s 100% Satisfaction Guarantee.